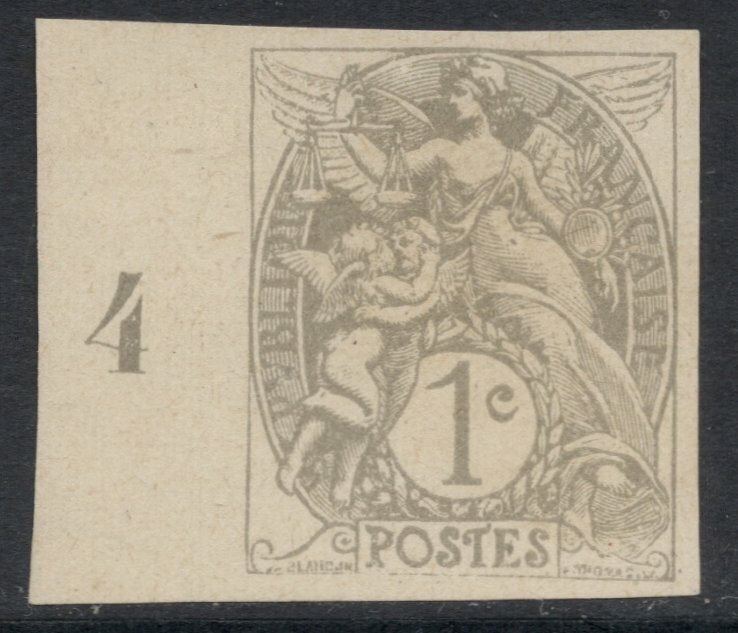 Sometimes I'm a little fed up messing about in philately on a restrictive budget and I want to go out and play with the big boys. Have a collection with a huge WOW factor. 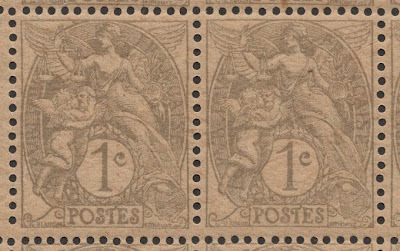 So I was getting overly excited when this big auction house came up with a sale based on a single French set: the 'Blanc' issues of 1900. I spent night after night browsing the luxurious catalogue and in the end just couldn't resist it. I threw all caution in the wind and placed a bid on four items. Being successful on 'only' three, I then went further and managed to obtain two unsold lots. And it all arrived yesterday, and I'm SOOOO chuffed! 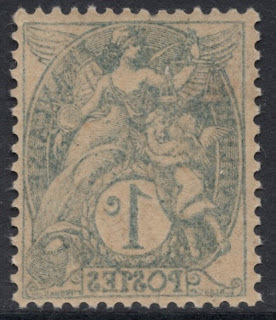 The Blanc stamps, named after their designer Paul Joseph Blanc, are an allegory of France, and include the Goddess of Freedom with phrygian cap, holding scales of justice, and cherubs kissing (apparently representing Fraternity). It's a busy design, but a true French classic. The first item I got was actually a mistake, due to my running headlong into a territory I'm unfamiliar with. 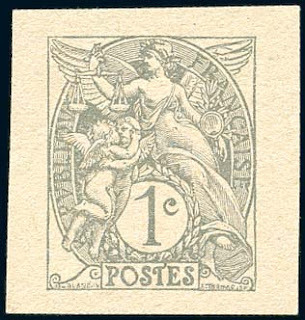 For it turns out to be a proof printing of the 1c grey to be used for postal stationery (newspaper wrappers) rather than stamps. 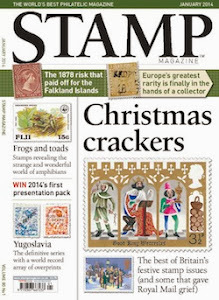 So I'll probably put it on eBay or Delcampe or a similar site as I'm a stamps-only man. 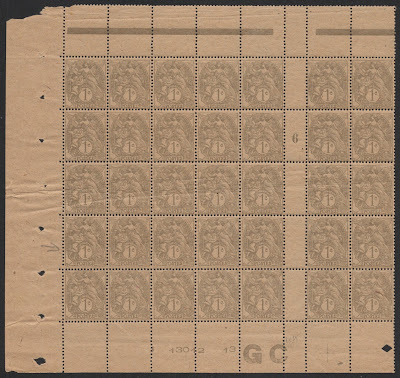 I was happier with my second lot: a block of 35 1c grey stamps, with loads of extra information. 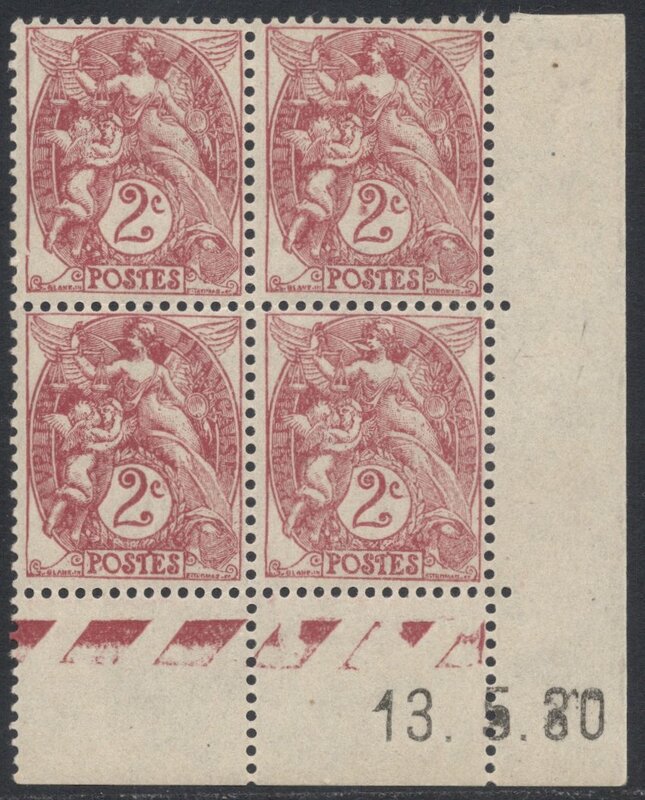 For example, in the bottom margin, we find the printing date (13 December), the number of the printing press (13) and the type of paper (GC, for Grande Consommation, or Bulk Use, if you like). Furher up we find the so-called millésime. 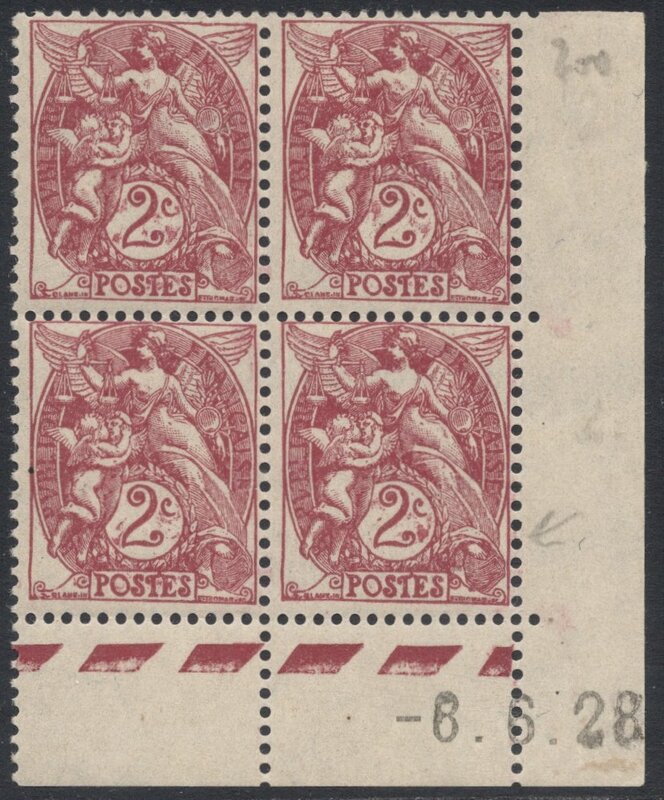 This number, 6 on this sheet, denotes the year of printing. In this case 1916. They are usually collected in gutter pairs, but it's so much nicer to have them in a large block like this! 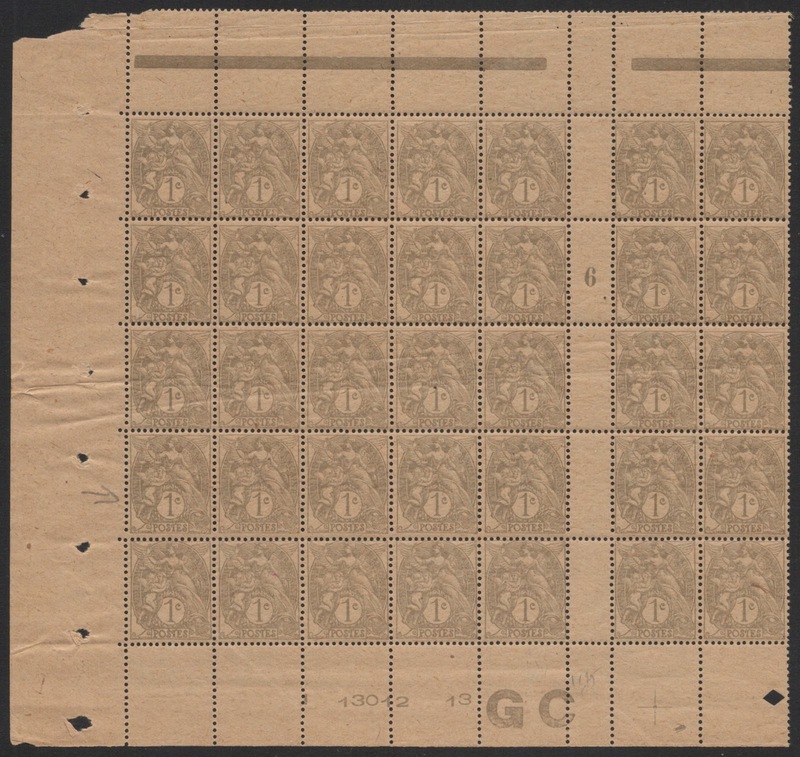 What's even more impressive is that this sheet consists of type 1a stamps, with only one copy being type 1b. For this we have to look at the white line to the left of AISE. 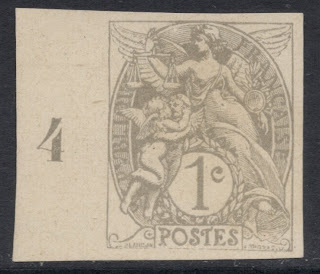 On type 1a this gets thinner, whereas on type 1b it remains of an even thickness. On the image above the left-hand stamp (which is to the right of the arrow on the big sheet) is type 1a and the right-hand stamp 1b. and a copy of the 1c grey-black with complete offset on the back. I also managed to get two dated-corner blocks of the 2c claret. 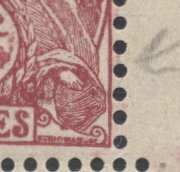 The first one, dated 6 June 1928, shows coloured spots in the value tablet. The second block, dated 13 May 1930, has a large spot in the 2 of the top right-hand stamp. 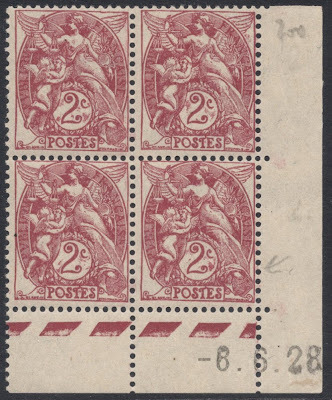 This is a constant variety for all printings of May 1930. Fantastic. I find all the information very interesting. Well done. Fantastic info you gave there. I need to spend more time looking at - rather than just collecting. Thanks! Yes, sometimes it pays to go deep rather than wide, if you see what I mean. So how about a posting with a Christmas theme? Bruno, you impatient man! It ain 't Friday yet! Oh, I did not realize it was a regular Friday debut. Now I know. Okay, I will wait patiently. Adrian: Enjoyed your excitement with the Blanc Issue. 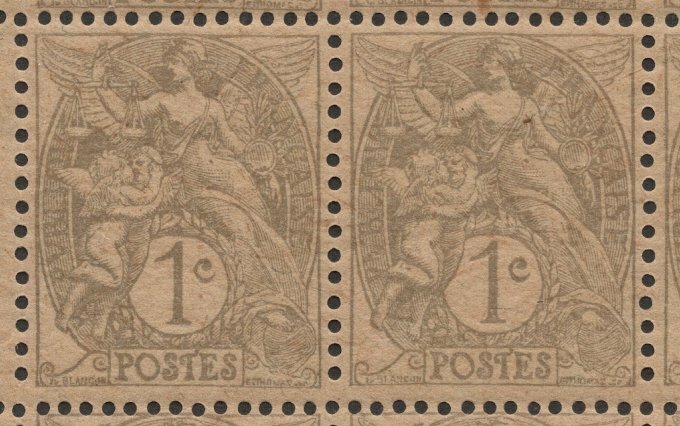 I have large accumulation to sell of this issue with several millesime pairs, etc. If interested, contact me soon at joecrosby@cox.net, as I am getting ready to consign to an auction. Thanks for the offer, but I'm afraid my Blanc collection is as large as I'd like it to be at this moment. Good luck with the auction!